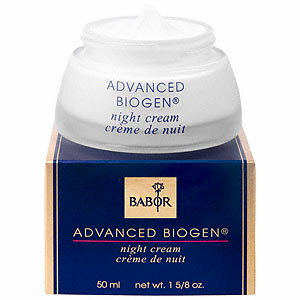 The Babor Advanced Biogen Night Cream will help with the signs of aging. It actually activates the skin's metabolism and decreases fine lines. It is a night cream that protects your face against free radicals during your skins most optimum resting phase....sleep. Since the ingredients include; jojoba, shea butter, sesame oil, beeswax, macadamia and primrose oils. I would only recommend this cream to those with dry skin. Those with combination or oily skin could lead to too much moisture. After cleansing, and before bed ... apply Biogen Night Cream liberally to face. A little goes a long way! Water (Aqua), Glycine Soja (Soybean) Oil, Simmondsia Chinensis (Jojoba) Seed Oil, Cetearyl Ethylhexanoate, Butyrospermum Parkii (Shea Butter) Fruit, Sesamum Indicum (Sesame) Seed Oil, Cetearyl Alcohol, Butylene Glycol, Steareth-2, Steareth-21, Poly Glyceryl-3 Beeswax, Glycerin, Propylene Glycol, Beeswax (Cera Alba), Macadamia Ternifolia Seed Oil, Cucurbita Pepo (Pumpkin) Extract, Mimosa Tenuiflora Bark Extract, Evening Primrose Oil, Retinyl Palmitate, Panthenol, Tocopherol, Ascorbyl Palmitate, Ascorbic Acid, Caprylic/capric Triglyceride, Isopropyl Myristate, Dimethicone, Citric Acid, Xanthan Gum, Fragrance (Parfum), Sodium Hydroxide, Pantolactone, Magnesium Aluminum Silcate, Sodium Cetearyl Sulfate, Alcohol, Phenoxyethanol, Methylparaben, Ethylparaben, Propylparaben, Butylparaben, Isobutylparaben, Dehydroacetic Acid, Sorbic Acid, Sodium Benzoate, Potassium Sorbate.